Equipo Nizkor - Statement of parliamentary groups in support of oral proceedings (Scilingo and Cavallo cases). 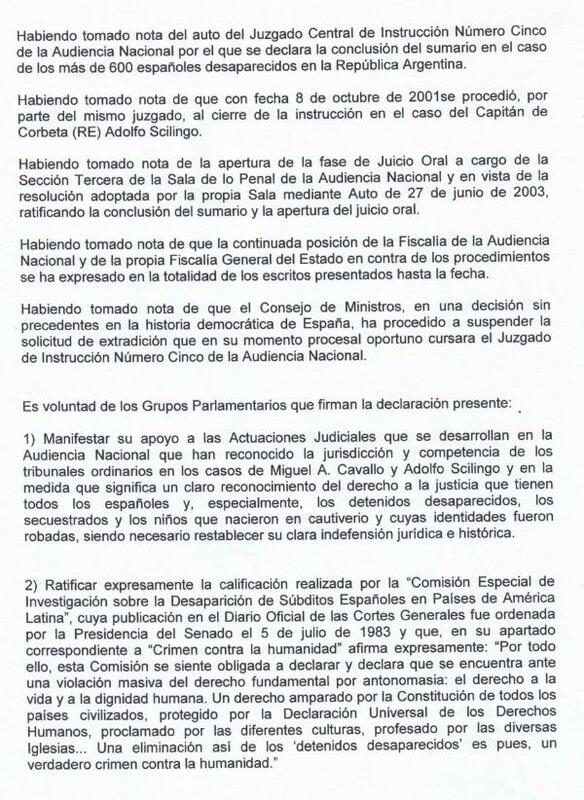 Statement by Spanish parliamentary groups in relation with the trial's opening phase in the cases of Adolfo Scilingo and Miguel A. Cavallo. Having taken notice of the decision issued by the Central Court of Investigation number 5 of the Audiencia Nacional declaring the end of the investigation proceedings in the case of more than 600 Spanish victims who disappeared in the Republic of Argentina. Having taken notice that as of October 8, 2001 the same court has declared the end of the investigation proceedings in the case of Corvette Captain (RE) Adolfo Scilingo. Having taken notice of the opening of the trial phase which will take place before Section 3 of the Criminal Division of the Audencia Nacional and in view of the resolution adopted by the same Division by means of its writ dated June 27, 2003, ratifying the end of the investigation proceedings and the opening of the trial. Having taken notice that the continuous position of the Prosecutor's Office of the Audencia Nacional and of the General Prosecutor of the State against the procedures has been expressed in all the writings and appeals submitted by the Prosecutor's Office to date. Having taken notice that the Council of Ministers, in a decision without precedent in the democratic history of Spain, has suspended the extradition request issued in due procedural time by the Central Court of Investigation number 5. 1) Express their support of the judicial proceedings that have developed in the Audiencia Nacional and which entail the recognition of the jurisdiction and competence of ordinary domestic courts in the cases of Miguel A. Cavallo and Adolfo Scilingo as well as a clear recognition of the right to justice that all Spanish citizens possess, especially, the detained-disappeared, the kidnapped and the children born in captivity, whose identities were stolen, thus making it necessary to reestablish their clear defenselessness both from a judicial and historic point of view. 2) Expressly ratify the offences' specification done by the "Special Investigatory Comission on the Disappearance of Spanish Subjects in the Countries of Latin America," whose publication in the Official Diary of both Houses of Parliament was ordered by the President of the Senate on the fifth of July, 1983, and that, in its paragraph entitled "Crimes Against Humanity" expressly affirms, "For all this, this Comission feels obligated to declare and declares that it finds itself before a massive violation of a fundamental right par excellence: the right to life and human dignity. A right sheltered by the Constitution of all civilized countries, protected by the Universal Declaration of Human Rights, proclaimed by different cultures, professed by diverse Churches... Such an elimination of the 'detained-disappeared' is therefore a true crime against humanity." 3) State that "Impunity" means the impossibility, de jure or de facto, of bringing the perpetrators of human rights violations to account - whether in criminal, civil, administrative or disciplinary proceedings - since they are not subject to any inquiry that might lead to their being accused, arrested, tried and, if found guilty, sentenced to appropriate penalties, and to making reparations to their victims. In this regard, the term 'serious crimes under international law' covers war crimes, crimes against humanity, including genocide, and grave breaches of international humanitarian law, as the UN document E/CN. 4/Sub. 2/1997/20/Rev.1, 2 October 1997 "Question of the impunity of perpetrators of human rights violations (civil and political)" reads. 4) Declare that the right to know the final destiny of what occurred to the victims of the repression in Argentina, is not simply the right of any individual victim or closely related persons to know what happened, (it is) a right to the truth. The right to know is also a collective right, drawing upon history to prevent violations from recurring in the future. Its corollary is a "duty to remember", which the State must assume, in order to guard against the perversions of history that go under the names of revisionism or negationism; the knowledge of the oppression it has lived through is part of a people's national heritage and as such must be preserved. These, then, are the main objectives of the right to know as a collective right, in accordance with what the UN document E/CN. 4/Sub. 2/1997/20/Rev.1, 2 October 1997 "Question of the impunity of perpetrators of human rights violations (civil and political)" states. 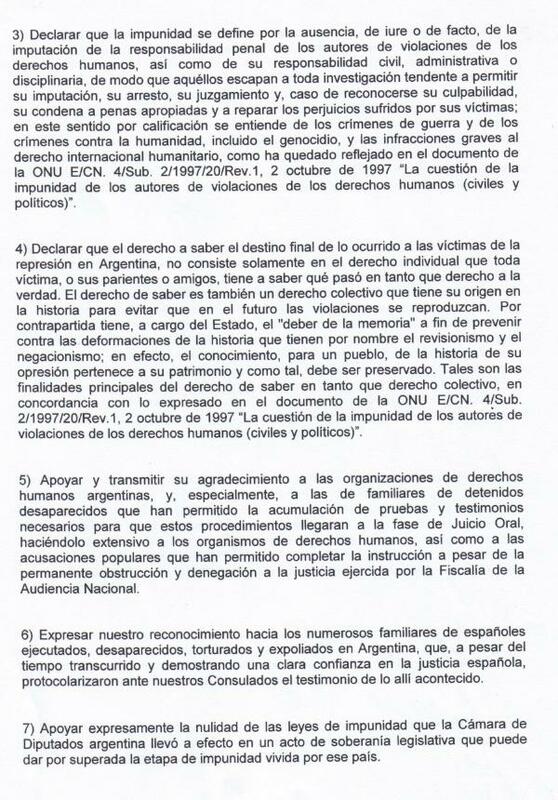 5) Support and transmit gratitude to the Argentinian human rights organizations, and especially, to the relatives of the detained-disappeared that have provided the necessary accumulation of proof and testimonies that have allowed these procedures to arrive at the trial phase, and also to the human rights organizations, as to the "acusaciones populares" (popular action) that have permitted the completion of the investigation proceedings despite the continuous obstruction and denials of justice exercised by the Prosecutor's Office of the Audencia Nacional. 6) Express our recognition of the numerous relatives of Spanish victims that were executed, disappeared, tortured and pillaged in Argentina, that despite the passage of time and demonstrating a clear confidence in Spanish justice, gave testimony before our Consulates of what occurred there. 7) Expressly support the nullification of the impunity laws that the Argentinian Chamber of Representatives brought into effect, in an act of legislative sovereignty that could overcome the stage of impunity living in that country. 8) Request the Spanish government to abandon its obstructing attitude towards the accomplishment of the right to justice and to not place any obstacle that will prevent the trial from going forward in a transparent form, permitting the case to arrive at a sentence for crimes against humanity in ordinary jurisdiction, which would be an important step in the fight against this type of crimes that offend the spirit of humanity and leave its authors outside any human categorization. In Madrid, December 11, 2003.